Stepping onto the threshold of this moment, my mind is swept away by the unfathomable calculations my soul has arranged for me to be here now. Standing in awe of absolute perfection, I fill with gratitude that I have awakened before the final nightfall. My hand now reaches for another who makes room within for You. IAM That IAM who reached for your hand. I remember thinking ‘How did I get here?’ the first time this happened to me. It felt like being pulled through a secret doorway and then suddenly left alone, standing in a most wondrous room. I arrived without being announced….. yet I knew I belonged to that moment and it was far more familiar to me than where I had been. 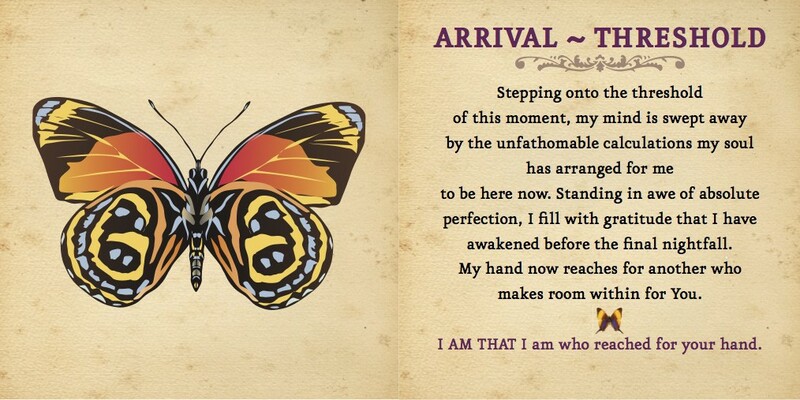 This entry was posted in Emerging Soul Cards and tagged Awakening, emerging soul card, Inspiration cards, Inspirational writing, second coming, Soul, threshold on February 2, 2015 by Rebecca Winters Rodriguez.